Directed by William A. Seiter, A Lady Takes a Chance is staged unusually well, the actors blocked in such a way to really maximize the film's humor and sweet romance. Even the picture's barroom brawl, already a clich� of Western movies, is done with a lot of imagination and one of the best of its type. 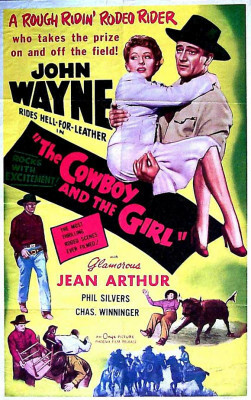 The screenplay tells a relatively simple story but does so with enormous charm and wit, tailor-made as it was to Arthur's and Wayne's screen personae. She falls madly in love with the impossibly handsome, appealing Duke. He's instantly attracted to her but, initially, thinks of her as a comely novelty from the usual western gals he normally carouses with. He's a free-spirit, up for anything short of settling down and getting married, while she, wanting to lasso him, tries to play it cool but can't hide her feelings for him.